Hydration is important for everyone, not just from a health standpoint, but for basic survival. Having enough water helps to regulate body temperature as well as lubricate the joints in the body for optimal, pain-free movement. It also removes waste from the body and has many other physical and mental benefits. Dehydration, which is a lack of hydration, can lead to lethargy, dizziness, cramps, and in some cases even shock. If you’d like to buy hydration test kits in Australia for the purposes of testing your own hydration or dehydration levels, or those of other people, discover the hydration testing equipment available from Corporate Health & Safety. 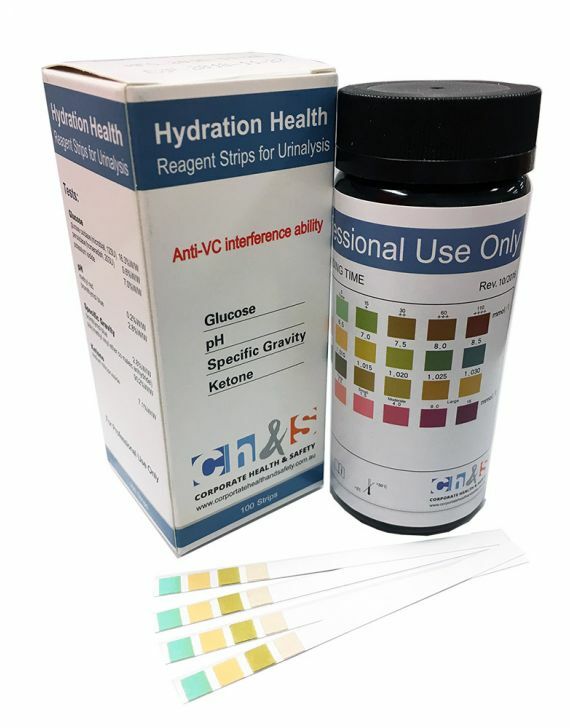 Though in many cases a person can gauge their hydration level from the colour of their urine (yellow means a lack of hydration, while clear urine points to sufficiently hydrated), a professional dehydration test kit containing hydration test strips might be required for more detailed or advanced information. At Corporate Health & Safety, you can buy hydration urine test strips online that can be used to accurately quantify a person’s level of hydration or dehydration. Our dehydration test strips measure the specific gravity of the urine – gravity being comprised of the water balance in the body as well as urine concentration – in order to determine whether a person is sufficiently hydrated or not. Hydration urine test strips from CH&S can help identify when an individual is or is becoming dehydrated. Your dehydrated urine kit will also provide an analysis of the composition of your urine. When a person does not drink enough water or loses large amounts of fluids because of diarrhoea, vomiting, sweating or strenuous exercise, dehydration can occur. When the body becomes dehydrated, it reabsorbs fluid from the blood and other body tissues. If a person is severely dehydrated, there is no longer enough fluid in the body to get blood to the vital organs and the person may begin to go into shock. Severe dehydration and shock are life threatening, making it important to use a dehydration test kit to determine hydration levels before a person’s health is negatively affected. If you’re looking to buy hydration test kits, discover the range of hydration kits online available from Corporate Health & Safety.